If you’ve got that new and improved iOS 9, then Safari now includes content blocking capabilities. These blockers are enabled or disabled through the Safari section of Settings, but if you want to temporarily view a site in the way its makers intended then there’s a quick shortcut. 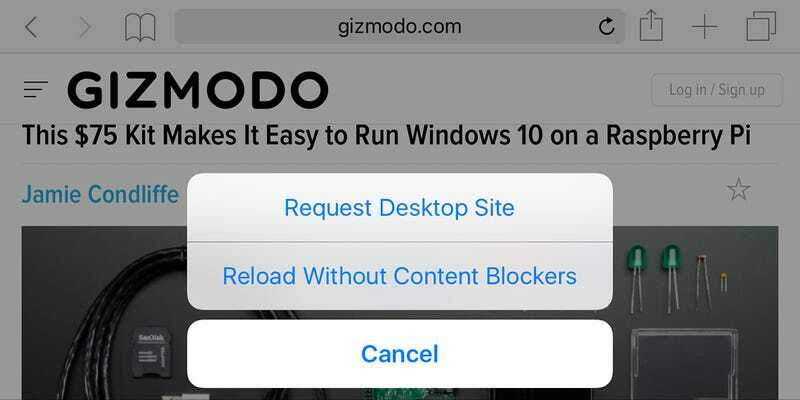 Tap and hold on the reload button in Safari and it gives you an option to Reload Without Content Blockers—you can quickly load up the full page, adverts and all, without having to switch off your blocker of choice. There’s also the option to request the desktop version of the site. Hat tip to Paul Hudson who spotted the shortcut before we saw it anywhere else. If you are using a content blocker to streamline your web browsing experience in iOS 9, remember that a lot of sites rely on advertising to fund them—if you enjoy reading a website and want to make sure it prospers, add it to the whitelist of unblocked pages inside your app of choice.